Many months ago, I pinned this tile design as an idea for a quilt. It’s perfectly suited for a quilt – randomly placed squares of all straight lines. The white kite fabric is a hand-me-down from my sister, who once upon a time used it as a bed canopy for her loft bed in the room we shared. I think she made me promise I would make her something out of it when she has a baby (don’t worry, there’s plenty left). I’m learning that the part of quilt-making that I actually enjoy is designing and making the quilt top – not so much the quilting process itself. The batting on this quilt is very thick and I was having all sorts of problems quilting the top/batting/back together – the backing kept getting pulled through the machine faster than the top, leading to some unsightly puckering. After a few attempts and a bunch of Googling, I bought a walking foot for my machine, which helps pull the top of a fabric sandwich through the machine. I also bought approximately 300 more quilting safety pins. 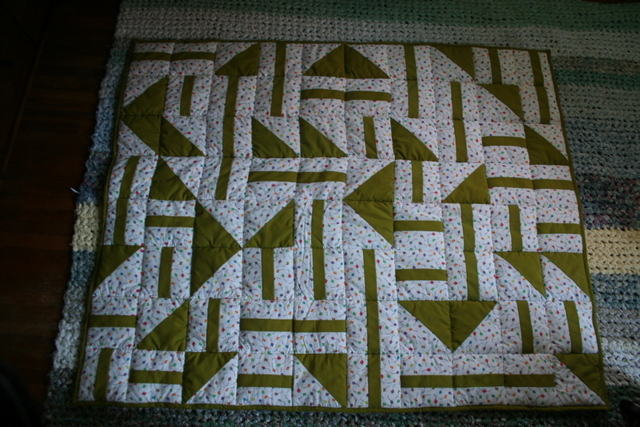 The combination of the two (but I think mostly the walking foot) made a big difference, and the rest of the quilting was pretty smooth. I probably should have unpicked one particularly bad quilting line that’s all puckered, but… I didn’t. And I’m okay with that. 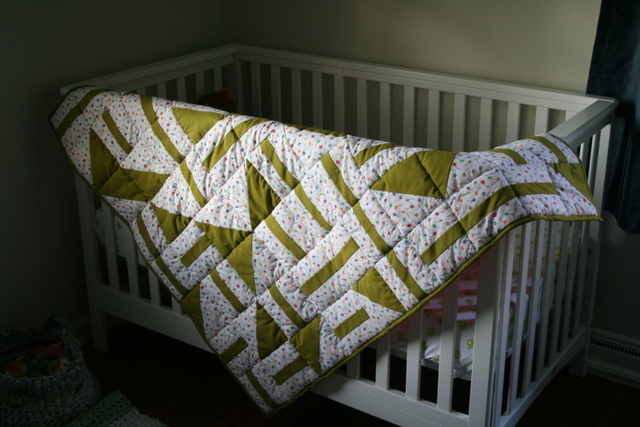 This quilt is destined for lots of floor+baby time, so I’m not anticipating that it will be pristine for long. 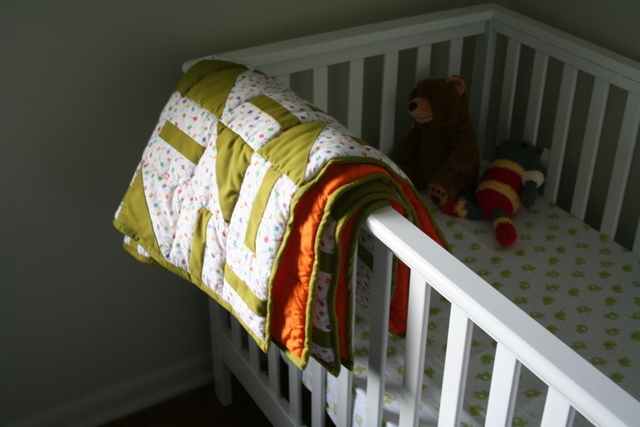 This entry was posted in baby, quilting. Bookmark the permalink. Qué tipo de tela has usado. En nuestra web telas para, encontrarás muchas ideas para hacer espero que os guste ¡Un saludo!